Bavaria has a unique flag. It is referred to as the Rautenflagge meaning lozenge flag, for the diamond shapes. This flag is ideal for Oktoberfest celebrations! 3'x5' polyester flag with white header and two grommets. Flags have four rows of stitches on the fly and two rows on the top, bottom, and header side. Image is screen printed and appears on both sides. 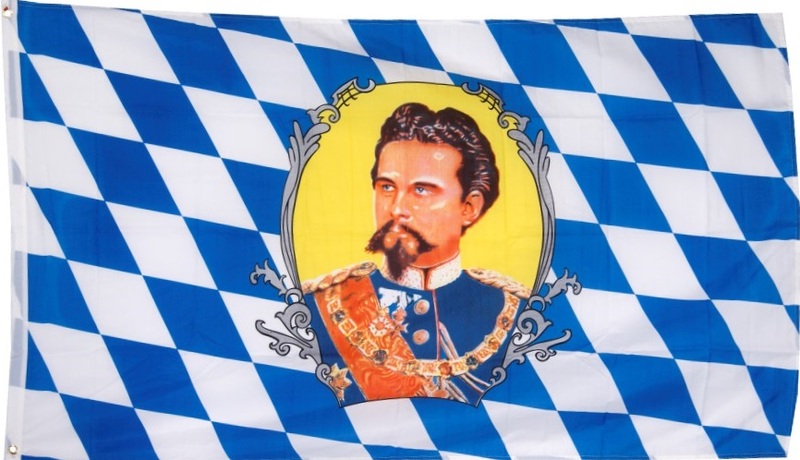 Bavarian flag with King Ludwig II. Bavaria has a unique flag. It is referred to as the Rautenflagge meaning lozenge flag, for the diamond shapes. This is a novelty version of the Bavarian flag. This flag is ideal for Oktoberfest celebrations! 3'x5' polyester flag with white header and two grommets. Image is screen printed and appears on both sides. Bavaria has a unique flag. It is referred to as the Rautenflagge meaning lozenge flag, for the diamond shapes. This is a novelty version of the Bavarian flag. This flag is ideal for Oktoberfest celebrations! 3'x5' polyester flag with white header and two grommets. Image is screen printed and appears on both sides. 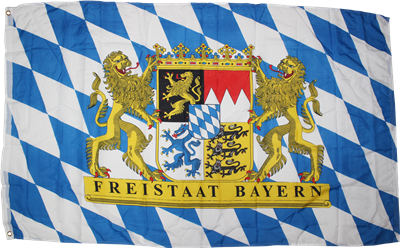 This is a Bavaria inspired novelty flag for Oktoberfest. This flag is ideal for Oktoberfest celebrations! 3'x5' polyester flag with white header and two grommets. Flags have four rows of stitches on the fly and two rows on the top, bottom, and header side. Image is screen printed and appears on both sides. 2'x3' polyester flag with white header and two grommets. Image is screen printed and appears on both sides. Says "Free State of Bavaria." 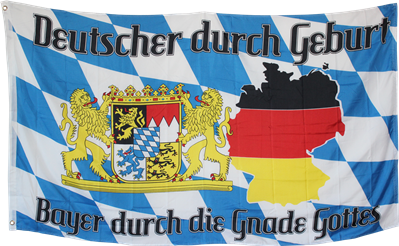 This is the perfect flag for your Oktoberfest party! Bavaria has a unique flag. It is referred to as the Rautenflagge meaning lozenge flag, for the diamond shapes. This is a novelty version of the Bavarian flag. This flag is ideal for Oktoberfest celebrations! 3'x5' polyester flag with white header and two grommets. Image is screen printed and appears on both sides. This is a novelty version of the German State flag. 3'x5' polyester flag with a white header and two grommets. The image is screen printed and appears on both sides. 3'x5' polyester flag with a white header and two grommets. The image is screen printed and appears on both sides. This flag has the dates of German's four victories in the FIFA World Cup. 3'x5' polyester flag with white header and two grommets. Flags have four rows of stitches on the fly and two rows on the top, bottom, and header side. Image is screen printed and appears on both sides. Novelty Deutschland flag.